A Sufi scholar once wrote to the Trappist monk Thomas Merton at his monastery nestled among the knobs of Kentucky to ask what he did, specifically, when he prayed. Merton answered, “It is not thinking about anything, but a direct seeking of the Face of the Invisible, which cannot be found unless we are lost in Him who is Invisible.” Merton and his fellow monks at Gesthemani embodied a view of worship that went beyond the idea that it was merely a ritual performed in a brick-and-mortar structure at a specified time each week, and Merton’s writings shattered any stereotype that all Christians prayed in the same way or worshiped in the same manner. Worship was for him an individual experience. He endorsed silence and meditation, actions that deviate from the contemporary concept of prayer specifically and worship generally, and viewed practices of contemplation, silent meditation, and engagement with nature as tools to remove the “I” from the world in order to discover the “not I.” These actions helped carve out the space where one could encounter God in God’s response within humanity. Merton developed his views on worship through engagement with early Christian conceptions of worship, and he invited his audience to take early Christian positions more seriously as valuable resources rather than to view them as relics of the past. Today, Christian worship is diverse in meaning and practice, making it difficult to define, but this diversity has its origins in early Christianity, when worship and ritual was quite fluid rather than static. For example, when and how a Christian prayed differed greatly between early Christian communities in Rome, Carthage, and Alexandria, from what time a Christian prayed to whether one kneels or stands. Today, Christian worship may use contemporary music or a cappella chant, traditional architecture or outdoor settings, baptism by aspersion or full immersion. Understanding Christian worship is difficult in the face of such diversity. But Andrew McGowan’s recent book on early Christian worship could help us realize Merton’s invitation to look back at early Christian practices of worship as useful resources for understanding Christian worship today. Ancient Christian Worship: Early Church Practices in Social, Historical, and Theological Perspective is a concise volume covering the history of Christian worship from the first century to the fifth century CE. McGowan, an expert on ritual practices in early Christianity, focuses each chapter on one aspect of worship, such as “Meal,” “Word,” “Music,” and “Prayer,” an approach useful for general readers and scholars alike. These topics have been treated with more depth by other church historians and liturgical scholars such as Paul Bradshaw and Maxwell Johnson, but McGowan offers a primer on ancient Christian worship to a broader audience. By doing so, he exhibits how a contemporary Christian can come to understand the foundations of daily or weekly Christian practice and the common thread of devotion that stretches across time. When the New Testament refers to worship, it does not imply what many Christians today would understand worship to be. The Greek word is proskynesis, which means “prostration.” The disciples are not singing, praying, or sharing a meal; rather, use of this term could imply that they are prostrating or performing some other ritual of piety. McGowan claims that in early Christianity, the idea of worship as involving uniform communal gatherings across the Roman world in brick-and-mortar church-like dwellings should be dispelled immediately. The Gospels reveal almost nothing about first century ritual practice. In the ancient world, “what we now call ‘worship’ did not exist.” Early Christians were only beginning to make articulate sounds in their development of a ritual language, and there was a variety of practice in the initial development in locales across the Roman Empire. By examining documents beyond the New Testament, such as the Didache, the Apostolic Tradition, and other early Christian writings that were written for different communities, McGowan identifies a common thread that describes ritual practice from Antioch to Carthage to Rome in spite of the diversity of worship and ritual practice evident in these documents. Whatever the liturgical actions in each community, they were motivated to it through a desire to perform service to God. “Worship” is thus broadly construed. One may say the Lord’s Prayer five times a day rather than three, or wake at dawn to celebrate the Lord’s Supper rather than later in the evening, but any manifestation of worship constitutes divine service. Even though Christian worship has always been diverse — as Christians moved from house churches to basilicas after Constantine — and there were no monolithic guidelines for how a Christian should worship, this sense of unity in diversity emerges through the course of McGowan’s study. McGowan’s chapter on meal practice is a good example of how different early Christian communities understood the practice of the Eucharist yet had a common emphasis on divine service. The practice of the Eucharist did not arrive ex nihilo but was shaped by Roman dining customs: just as a Roman banquet involved food, wine, and conversation, so too did the Christian ritual meal. The Roman author Plutarch remarked that eating is one thing, but a person has not truly dined until engaging in conversation with others. Christian meal practice and its debt to Roman antecedents is captured vividly in early Christian iconography. In the catacombs of Rome, early Christians would meet to share a meal with the inhumed, to dine with the dead. At early-fourth-century Catacomb of Peter and Marcellinus, several frescoes feature banquet scenes, including one with an inscription ordering the servant to “mix the wine,” indicating the conviviality involved in the feast (Figure 1). Early Christian art provides a useful aid to illustrate the synergistic quality of ancient Christian worship. Figure 1: Fresco depicting a banquet. From the Catacombs of St. Marcellinus and Peter. Image via Wikimedia Commons. Religious dining also comes into play in 1 Corinthians, where the question of eating of food or meat sacrificed to other gods comes up. Paul at one point permits the eating of food sacrificed to idols, then didactically states that no Christian can eat at the “table of the Lord” and at the “table of demons.” What Paul foreshadowed was the eventual endowment of Christian meal practice with a type of power, where the lines were drawn between Christian food and non-Christian food. Later early Christian authors such as Cyprian of Carthage go so far as to indicate that someone who has eaten idol food and then eats Christian food will be harmed by it. As McGowan explains, the development of the Eucharist was a movement from a banquet with Roman cultural influence to a memorial meal not meant to sate hunger. He charts the path the Eucharist took in ancient Christian worship to becoming something more than just a meal tradition, as he puts it, a transition from “banquet to sacrament.” But there are still elements of the Roman banquet tradition in Eucharistic practice as late as the fourth century, a point that McGowan should embellish even further. Even more compelling is the fact that lay participation in the Eucharist was discouraged several centuries later in western medieval liturgy, replaced by spiritual reception rather than physical reception of the elements. The variety in practice and theology in later eras are beyond the scope of McGowan’s study, yet more attention to later historical development would help a general audience connect their own practices with those from antiquity. 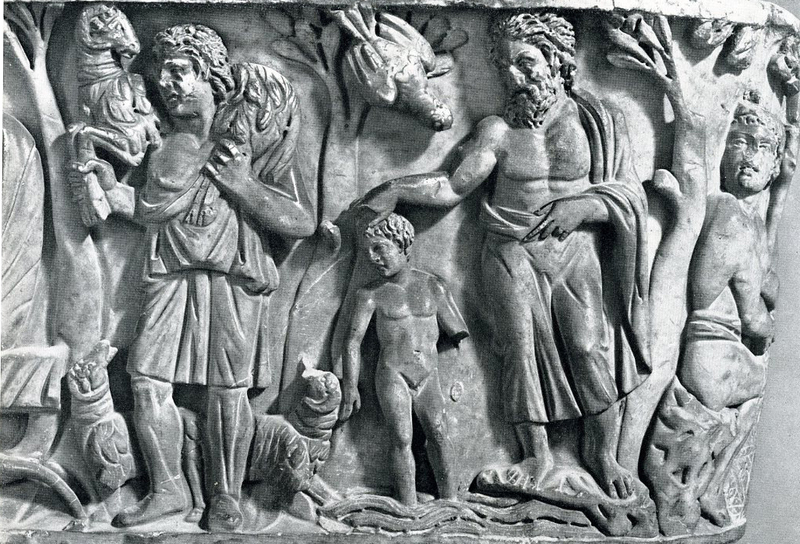 Initiation rituals in early Christianity were also diverse. Baptism is first described in the New Testament with the introduction of the figure of John the Baptist. Water lustration practices were common in first-century Judaism — for example, in the Qumran community, which also produced the Dead Sea Scrolls — and arguably influenced John’s practice and Christian initiation practice in the late first century. As McGowan clarifies, from the first century forward, different groups perceived the ritual of baptism differently. The Didache mentions that baptism must be performed in running water, while Tertullian of Carthage writes in the late second century of wayward groups performing waterless baptisms. Cyril, bishop of Jerusalem in the fourth century, tells us that pilgrims travelling to the Holy Sepulcher to be baptized saw their baptism as participation in the death of Jesus (as in Paul’s letter to the Romans). The descent into the baptismal font is akin to the descent into the tomb, and the ascent on the other side is the resurrection to new life in Christ. This emphasis can also be seen in early Christian funerary art as Christians chose the image of the baptism of Jesus to adorn their sarcophagi, thus baptism became a symbol of new life or the resurrected life (Figure 2). Figure 2: Santa Maria Antiqua Sarcophagus. Image via oneonta.edu. Perhaps no other aspect of ancient Christian worship was as varied in practice as baptism. In some areas preparation (the catechumenate) lasted months or even years. But the unifying factor was the mystery of the initiation ritual and, recalling the Acts text, the impartation of the Holy Spirit. Baptism was the dramatic climax of one’s entry into the Christian congregation, to new life. Thus, in Rome, baptisms took place in baptisteries separate from the church basilica and were often decorated with images of the baptism of Jesus. In Ravenna, a mosaic of the baptism of Jesus is on the ceiling, directly above the baptismal font, as if the person is visually sharing their baptism with Jesus (Figure 3). Figure 3: Ceiling mosaic of the Baptisery of Neon, Ravenna. Image via Wikimedia Commons. Aside from the twin sacraments of the Eucharist and baptism, other rites and rituals that comprise ancient Christian worship are usually centered on the word, either spoken or sung. Sermons, readings, singing psalms or hymns, and prayer are all found in various forms in the early centuries as they began to shape different aspects of Christian liturgy. Prayer in the ancient church involved the body as well as the mind, was communal as well as individual, and took place at specific times and places during the day. Early Christian prayer bore more of a resemblance to Islamic prayer, where the communal body moves and speaks in unison. “Preaching” and “prayer,” like “worship,” have garnered different meanings since the ancient period as church society and culture has changed. McGowan also surveys the construction of sacred time, designating the feast days such as Pentecost, Lent, and Advent that began to mark the liturgical year. Here he follows in the wake of Bradshaw, Johnson, and also Thomas Talley who wrote on the origins of the liturgical year. Early on, different groups celebrated the death and resurrection of Jesus on different days. Even the beginning of the feast of the nativity — what became known as Christmas — was a late arrival in Christendom, celebrated as a feast for the first time perhaps in the late third or early fourth century. As Christians began to observe the relics of the saints in Late Antiquity, a new interest arose in celebrating the feast of the saints on specific days, even dining and drinking at the tomb of the saints. The feasts came to be so rowdy that Paulinus of Nola and Augustine, among others, criticized the crowds for their frivolity. Paulinus and Augustine’s attempts at correcting such behavior suggests an ingrained practice at the time, an intense devotion to the sacred combined with elements of Roman conviviality. The great contribution of McGowan’s book is that early Christian worship, in his words, was not about services, but service. Early Christians were performing various practices to render service to their God, demonstrating their obedience and obligation to God. McGowan shows that the diversity within ancient Christian worship was unified by the conviction that the various practices were rooted in this understanding of divine service. Despite diversity in thought and action there was commonality in the rationale behind it. Obedience and dedication to God drove the festal gatherings at the tomb of the saints as well as the development of the Eucharist and baptismal initiation. Worship was indeed service to God in its various iterations. McGowan’s synthesis of earlier liturgical scholarship succeeds in making the Christian ritual tradition accessible to non-specialists. Merton was not surprised to discover in ancient Christian worship tools to recover the importance of Christian service. As a novice master at Gethsemani, he would regularly teach early Christian figures and their writings, as well as the common goal they shared: union with God. This valuable book helps highlight those tools for the general reader, ones that allow the discovery of unity in the midst of diversity, of the beauty of service to God rather than services for God.